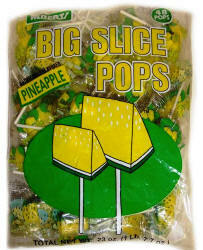 Big Slice Pineapple Pops 48ct - $6.50 - Other Albert's Big Slice Pop flavors include Watermelon, Blue Raspberry, Cherry, Strawberry, Peach, Pineapple, Green Apple in 48 pop bags. With their beautiful golden color and extraordinary tropical flavor, pineapples are one of the world’s most delightful fruits. 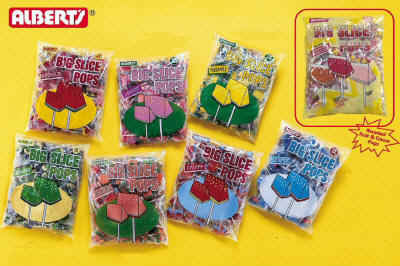 Every single bite is like a little mouthful of sunshine, and boy does it taste good!